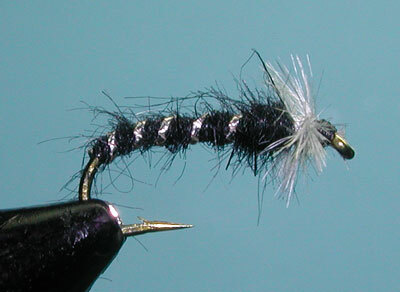 Notes: The TDC (Thompson's Delectable Chironomid) was developed by Richard B.Thompson in the late 1950's. Richard was a Fishery Biologist for the State of Washington. Prior to this fly, Chironomid flyfishing within lakes was just not done. Richard developed techniques with this fly, such as utilizing an indicator for depth control and fishing the pattern off the bottom of the lake with a slow retrieve. He wrote an article , "Chironomids and Trout" that was published within the State of Washington's Game Bulletin describing his TDC fly. 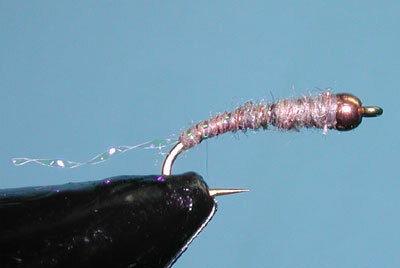 Many tried using the Chironomid pattern but failed, due to their habit of using a fast retireve. 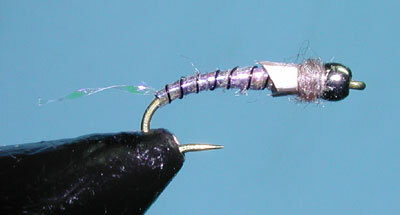 However, by the early 1960's, his techniques caught on with other lake flyfishermen and a number of other Chironomid patterns were developed. 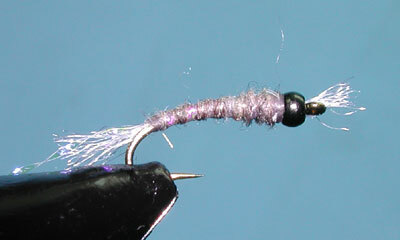 His TDC pattern, using a dubbed body, remains highly effective and is the basis for many new variations. One of the best known variations within the Sierras is Guide Tom Loe's of Sierra Drifters series of chironomid pupas and emergers that he developed in the 1990's for Crowley Lake. 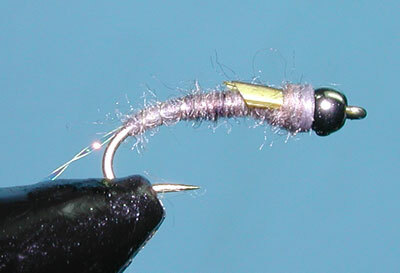 The Chironomid Pupa is a Adams Gray dubbed body with copper ribbing and copper beadhead. He usually adds a strand of lite brite to the body for some attraction. The Chironomid emerger is similar but with the addition of White Antron for the shuck and the gills. Tom uses a Tungsten beadhead with a Adams Gray dubbed body that is ribbed by a fine silver wire and Pearl Brite. The Pupa is usually fished motionless just off the bottom but the emerger can be fished with a slow retrieve to provide some movement. His emerger pattern has also been used as a dropper from a streamer pattern, like a Mohair Leech, with much success. The Gilly's are basically pupa patterns with a pair of biots representing wing pads It is suggested for shallow water presentations in 3-7' depths. Tom likes to apply a tail of a single strand of Krystal Flash to all of his Chironomid patterns for attraction.